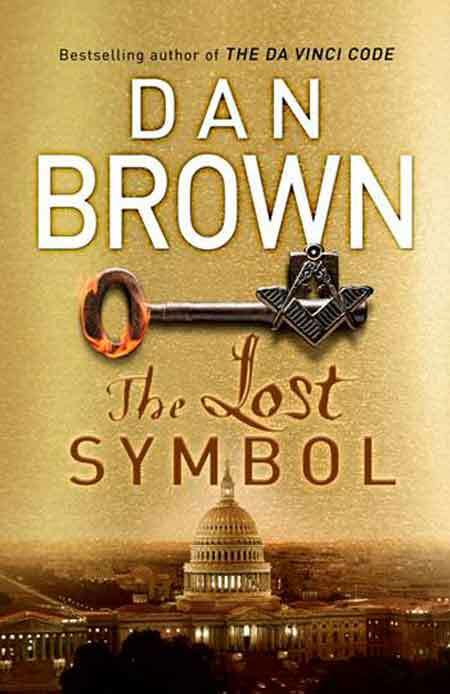 On September 15th 2009, Dan Brown will release his next book entitled ‘The Lost Symbol’. The book will surely give his readers much to ponder. It has taken six years for his new book to mature and allegedly a lot of research went into this book to become the sequel of the ‘Da Vinci Code’. Although no one yet knows what the book will be about, it has been revealed earlier that the plot of the book will focus on the Key of Solomon, Freemasonry and the Capitol of the United States, Washington D.C. At the time of this writing, only the book release date and the covers of the US and UK editions of the book are known. Though it is easy to endlessly speculate about both the exact and general details to be revealed between its covers, we would however, like to share some insight into the very interesting clues Dan Brown has decided to share thus far. The most telling clues happen to be the covers themselves! Like many ancient symbols and traditions, the answers (or keys) are hidden in plain sight . . . . . This article will delve into these subjects and share the obvious and factual encoded esoteric knowledge that Mr. Brown will likely reveal in his fictional work. The authors are fully aware that what is written here is fully speculative when comparing it to the contents of a yet-to-be released book. Even if our material is not fully-covered within ‘The Lost Symbol’, this article will still provide intriguing, thought-provoking, and eye-opening material supplementary or paralleling to what Dan Brown will be releasing. We will enlighten the reader as to the origins of Christianity, Precession of the Equinoxes, Freemasonry and the design of Washington D.C. and last but not least, the Key of Solomon. Lastly, we put forward that all data and discoveries are our own unless otherwise referenced and hence given credit. Unlike a fictional plot line, this material is factual, precise, and easy for anyone verify. Why do we believe that Dan Brown will touch on the subject of the Precession of the Equinoxes and the esoteric knowledge embedded within Christianity? Firstly, the ancient Egyptian hieroglyph of the Sun is depicted on the cover of the US version of ‘The Lost Symbol’. This symbol is a dot within a circle and represents the solar deity ‘Ra’. This is a well-known symbol within Freemasonry. The dot within a circle can be found in the letter ‘O’ of DA VINCI CODE. Secondly, the angle of the tilted Earth Axis, 23.5 degrees was encoded on the cover of the US edition. The title contains italic text and it so happens that the slant angle of this text is exactly 23.5 degrees. This also holds true for the slant angles of some of the capital letters of the title, such as the letter ‘V’ and ‘A’ in DA VINCI CODE. 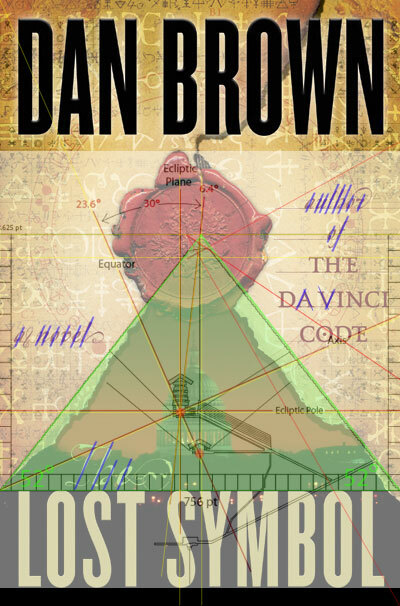 These clues released in the US book cover makes us strongly suspect that Dan Brown may have been inspired by the work of Gary Osborn and will touch on the ancient esoteric and astronomical knowledge about the ‘Precession of the Equinoxes’ embedded within Christianity. 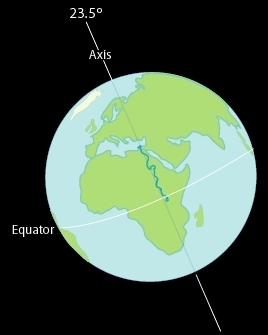 The phenomenon of ‘Precession’ is made possible by the tilt of the Earth’s Axis at 23.5 degrees from the Ecliptic Plane. Because of this axial tilt, the Earth has a slow ‘wobble’ (like a top winding down) that takes about 26,000 years to complete. This movement causes the equinox and solstice points to move along the path of the Sun, or Ecliptic. 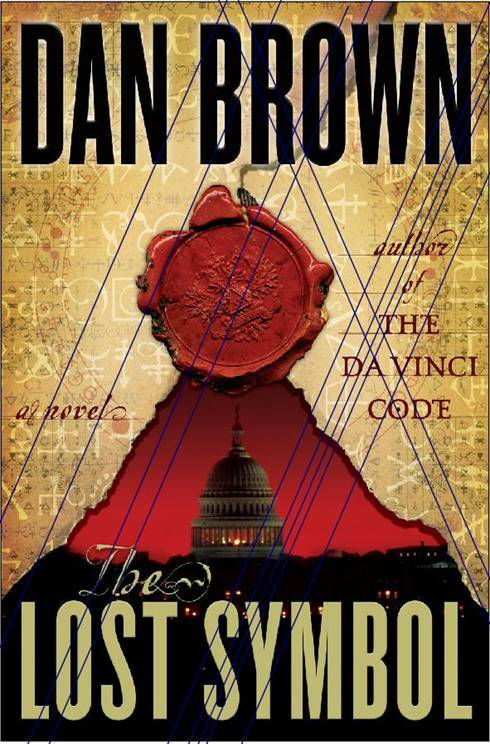 The repetition of this very specific angle on the cover of ‘The Lost Symbol’ seems to be hinting about Precession. The slanted lines are measured at 23.5 degrees. The words ‘a novel’ and ‘author of’ are tilted 23.5 degrees. This same angle is also found in ‘A’ and ‘V’ of ‘DA VINCI CODE’. The latter may explain why ‘DA VINCI CODE’ was done in capitals. Circle with a dot in the word ‘CODE’ represents the Egyptian solar deity Ra. ‘The Lost Symbol’ will most likely be ‘The Key of Solomon’ since this was the initial working title for the book. 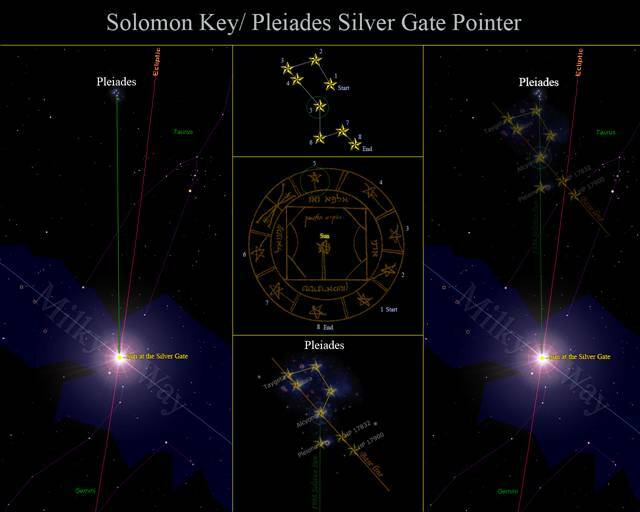 We have extensively researched the entire Key of Solomon on this website, and you can find our more-detailed interpretation of its significance here . 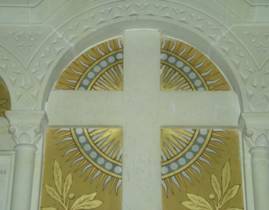 The aforementioned ‘lost symbol’, the eight-pointed cross, can be found in Churches around the world in great abundance. Just recently, we discovered new compelling evidence to suggest this ‘lost symbol’ ties in with the Christian End Times doctrine as will be explained in this article. We suggest that the release date of Dan Brown’s latest novel was not randomly chosen, but that the date itself is a very important clue that ties in with the subject of the book. In the modern Gregorian calendar, September 15th happens to be the the day of the ‘Exaltation of the Holy Cross’ (13, 14 and 15 of September). Earlier, we wrote on the significance of the day of the .Exaltation of the Holy Cross’ or the day of the ‘True Cross. In Latin, this day was called ‘Exaltatio Sanctae Crucis’ (literally, ‘Raising Aloft of the Holy Cross’). Later, we will demonstrate later what this raising of the Holy Cross means in astronomical terms. Officially the day of the 'Exaltation of the Holy Cross' starts at september 14th, but it it celebrated for three days. September 15th is officially the feast of ‘Our Lady of Sorrows’. The ‘true cross’ on which Jesus died was supposedly recovered by Helena Augusta, the mother of Emperor Constantine the Great. She built the ‘Church of the Holy Sepulchre’ in Jerusalem to store the remains of the (wooden) cross she recovered. The day of the ‘True Cross’ was henceforth associated with the consecration date of the Church of Holy Sepulchre; September 13, 335 AD. The 13th, 14th and 15th of September are still being used today to celebrate the day of the ‘raising of the cross’ and to venerate the ‘true cross’ of Christ. Both the ‘raising of the cross’ and the ‘true cross’ have profound astronomical connotations as we will demonstrate. We speculated before that, in reality, Helena (the mother of Constantine the Great) did not recover the original wooden cross Christ was crucified on, but instead found the pagan astronomical origins of the cross, including the origins of Christianity itself. Seeking to unite the crumbling Roman Empire under one religion, Her son Constantine then went on to establish and found the Catholic Church at the Nicean Council in 325 AD. Next, he systematically destroyed all pagan roots that could reveal the true origins of Christianity. Although the exoteric and tangible roots were destroyed, the esoteric roots of Christianity were preserved. Catholic churches still contain the secret, esoteric and occult information revealing the religion’s secret origins. The truth is that Christianity originated from the pagan Sun-worshipping cults that it has vehemently been trying to destroy from the earliest founding. These pagan cults venerated Sun gods and were keepers of time (tracing the Sun’s movement along the 12 signs of the Zodiac caused by a phenomenon called the ‘Precession of the Equinoxes’). Central in these pagan religions were Sun gods, all born from virgin mothers on the Winter Solstice, or around December 25th. Like Jesus, these Sun gods died on the cross at the Vernal Equinox, around March 21st. The authors Timothy Freke and Peter Gandy have revealed the striking similarities of the pre-cursor ‘Saviours’ (Osiris, Dionysis, Attis, Adonis, Mithras and many others) of Christianity in their book ‘The Jesus Mysteries, was the original Jesus a pagan God?’. What the authors have found in their research supports the thesis put forward by Timothy Freke and Peter Gandy; Christianity rose from the ashes of the pagan Sun worshipping religions, the pagan roots were destroyed such that a ‘new’ religion on the dawn of the Age of Pisces could emerge. Christianity far from original; it has borrowed almost every aspect of the Jesus stories in the New Testament from much older pagan myths as Timothy Freke and Peter Gandy convincingly prove in their book. 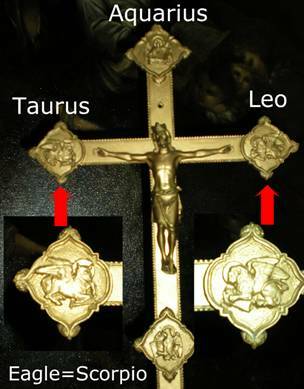 The authors therefore put forward the suggestion that the ‘true cross’ venerated on September 15th is not the cross that Jesus was crucified on, but is nothing less than the cross of the Zodiac formed by the four fixed signs Leo, Taurus, Aquarius and Scorpio. Proof exists for this thesis since this ancient pagan knowledge is still displayed in churches today. 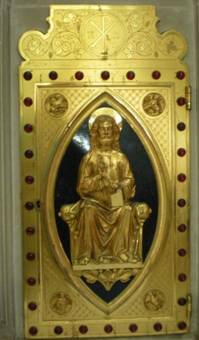 Jesus portrayed at the Last Judgment can often be found in the Tympanium above the entrance of churches and cathedrals. 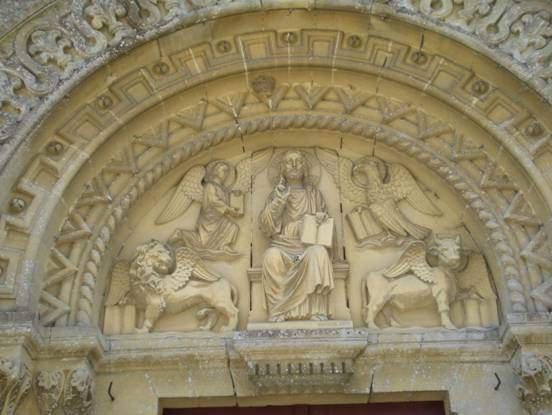 Notice, the lion (Leo) on the left, the bull on the right (Taurus), the angel on the left (Aquarius) and the eagle on the right ( Scorpio). Emperor Constantine the Great, who played such a fundamental role and basically shaped the modern Catholic Church, saw in a dream a ‘cross in the Sun’ and this symbol became Chi-Rho symbol in Christianity. Jesus at ‘Judgment Day’ inside a Vesica Pisces (Age of Pisces) and surrounded by the four signs Leo, Taurus, Aquarius and Scrorpio (Eagle) with the Chi-Rho on top. Cathedral Lisieux, France. 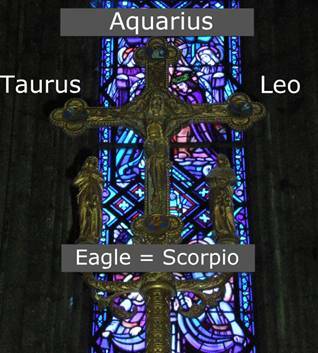 The four fixed signs of the Zodiac found in Christian art form a four-pointed cross in the 12 signs of the Zodiac. We have postulated before that this cross is actually one of two crosses that merge around era-2012 to mark the ‘End of Times’ in the Precession cycle. We have called the four-pointed cross formed by Leo, Taurus, Aquarius and Scorpio the ancient understanding of the ‘Galactic Cross’. These four signs rise before the Sun during moments of Great Celestial Conjunctions. To be more precise, the Galactic Cross is formed by the intersection of the Ecliptic and the Galactic Equator. (for a clear explanation, see earlier writings on the subject see and http://www.keyofsolomon.org/part1.php). In short, a Great Celestial Conjunction is the merger of two crosses in the Zodiac; the first cross is the aforementioned Galactic Cross (in ancient times denoted by the Leo-Taurus-Aquarius-Scorpio cross) and the second cross is the Equinox-Solstitium cross. Around era-2012, both crosses merge to become a single four-pointed cross. Although we have extensively written about the significance of the eight-pointed cross occurring in Christian occult symbolism, we have found new convincing proof to suggest that the eight-pointed cross is a symbol of the ‘End of Times’, or Great Celestial Conjunction, that occurs when the two Zodiac crosses merge. Currently, we live in a time of a Great Celestial Conjunction and refer to it as era-2012 for it occurs between the years 1978-2017. This latter fact is commonly misunderstood. It is termed ‘era-2012’ since this Great Celestial Conjunction corresponds with the ending of the Maya calendar on the Winter Solstice of 2012. 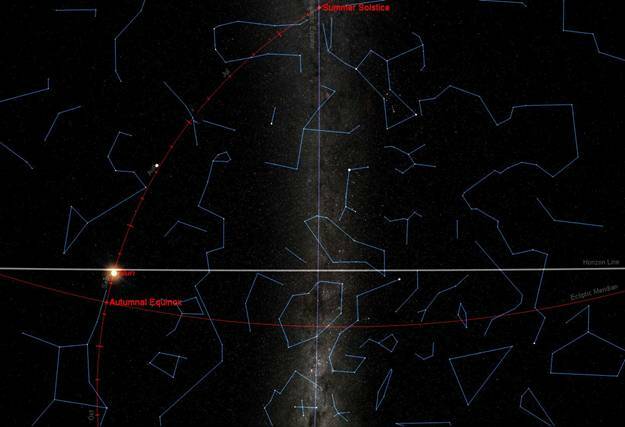 Galactic Alignment is simply another perspective of the Great Celestial Conjunction. 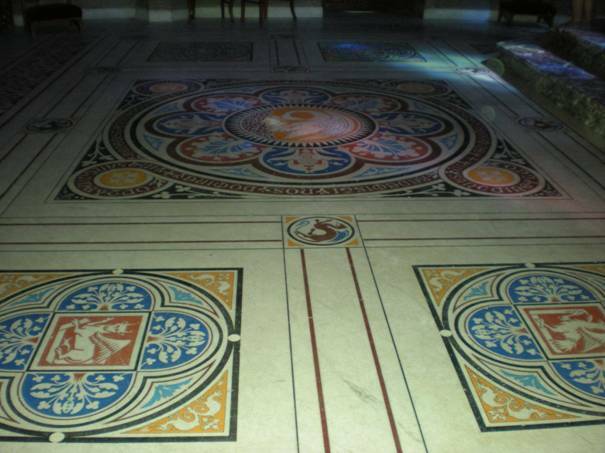 In a small Baselique near the coast of France in d’Ouvres Delivrande, we discovered a very intriguing mosaic on the ground; it was in front of the alter. The four signs of the Zodiac forming the Galactic Cross were depicted at the corners of the mosaic. In the center, the Sun with its rays was depicted. 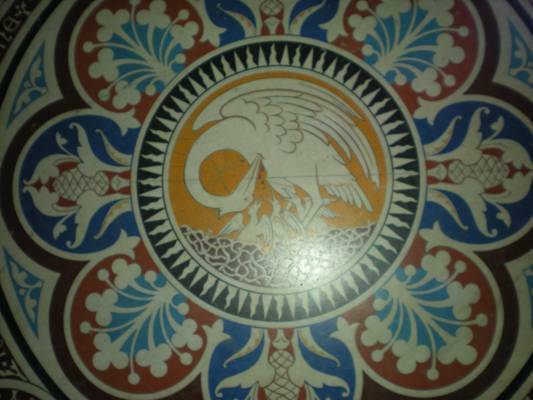 Inside the Sun, there was what appears to be a Benu bird or phoenix.. The Benu bird represented the soul of the Sun God Ra in ancient Egypt and was associated with rebirth and renewal. Symbolically, it encodes the death and rebirth of the Sun in the Precession cycle at the ‘End of Times’. Whether the bird is a Benu bird or not, the bird in the mosaic can certainly be associated with self sacrifice, death, and rebirth. This symbolism is obvious since it feeds it’s offshoot with its own blood by killing itself (beak enters the heart of the bird) such that the offshoot may live. It is therefore beyond any doubt that this symbol represents the dead and rebirth of the Sun. Baselique, d’Ouvres Delivrande, Benu bird inside the Sun sacrifices itself such that it’s offshoot can live. Iit represents the dead and rebirth of the Sun. What we have been demonstrating in our work is that at the ‘End of Times’ when the Sun has completed a full precession cycle of 26,000 years, it will die only to be reborn in a new cycle as such was the belief system of the ancients. There is a far more compelling reason to associate the ‘tree cross’ with the Galactic Cross. There is a striking correspondence with the tree-like cross and the ‘World Tree’ or Yggdrassil in Norse mythology. Scholars in the past have associated the World Tree, appearing in several mythologies around the world, with the Milky Way. In our work and theory, the Galactic Cross has been defined as the cross formed by the crossing of the Ecliptic and Milky Way. We therefore suggest that the Yggdrasil Cross, or tree cross, represents the Galactic Cross, since the World Tree can therefore be regarded to be symbolic of the Galactic Cross. As we have demonstrated consistently throughout our work, the eight-pointed cross is the combined cross of two four-pointed crosses, the Galactic Cross and the Earth or (Equinox-Solstitium) Cross that around era-2012 will merge to herald a New Age (End of Times). We were not surprised to find Christian esoteric symbolism in the the Basilique de Notre Dame of Delivrande, since the church contained a statue of a black Madonna (black version of Mary). Several researchers have pointed to the fact that the Black Madonna esoterically stands for the Egyptian mythological figure Isis, the mother of the Sun god Horus. Christianity copied the concept of the virgin birth and conception of the Son of God from the Isis mythology. In the Baselique in Delivrande, we discovered a stained glass window containing the twelve signs of the Zodiac. Central in the window ‘Mary’ was depicted; however, she’s not Mary but the black Madonna Isis since she’s been adorned with the horns of Isis. In ancient Egypt Isis was depicted with two horns with the Sun in between. In Freemasonry Isis esoterically represents the Sun in Taurus. What we have added to this observation is that in-between the horns of Taurus the crossing of the Ecliptic and Milky Way occurs in the Zodiac sign of Gemini. This happens to be the place where the Sun resides at the End of Times at the Summer Solstice in era-2012 at the time of a Galactic Alignment (Sun on the Galactic Equator of the Milky Way. This is the place of the Sun’s rebirth in the 26,000 year Precession cycle. So, Isis may esoterically represent the Sun at the crossing of Ecliptic and Milky Way at the Summer Solstice in Gemini at the End of Times. 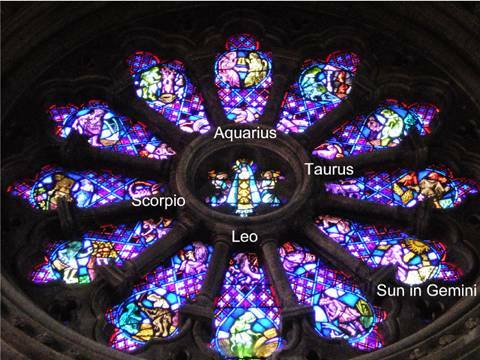 We were not surprised to discover that in stained glass window the Sun was depicted in the sign of Gemini! Place of the rebirth of the Sun at the Summer Solstice era-2012. We surmise that Dan Brown will be revealing a lot of new things about the origins of Christianity and the Sun cult adoration upon which it was founded. We would be surprised if Dan Brown also touched the End Times doctrine of Christianity and the ancient belief system of the ending of a Precession cycle it is based on; however, he will most likely touch on the phenomenon of precession and how it played a key role in the religious system of the ancient Egyptian civilization. Knowledge that secretly and esoterically entered into the domain of religion because the ancient Egyptian priests were not only the keepers of time but were in fact astute astronomers, a fact not recognized by most scholars today. This ‘secret’ science was only available to the initiated and not to the mundane. This is why the roots of secret societies such as Freemasonry trace back to Egypt. The authors also support the work of Gary Osborn who in his research has revealed that a lot of Christian artwork secretly encodes the 23.5 degree tilt of the Earth Axis. We have since discovered quite a rich collection of examples of Christian artwork ourselves that secretly encode this 23.5 degree angle. Left: Zagreb cathedral, arms and head of Christ are tilted 23.5 degrees. Notice the cross itself is an eight-pointed cross. 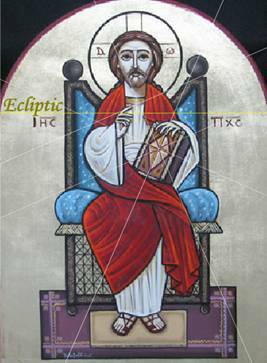 Right: Christ depicted as the Pantocrator, all white lines make angles of 23.5 degrees with respect to the Ecliptic. Notice how the eight-pointed cross on the bible is perfectly tilted to 23.5 degrees. 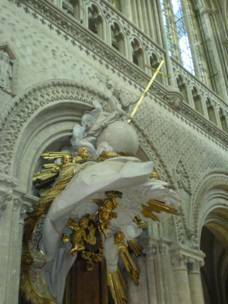 The cathedral in Bayeux contains an interesting statue of an angel on a globe holding a tilted cross, similar to the tilting of the Earth Axis. Since the cross she holds could esoterically encode a Zodiac cross as we have demonstrated before, we surmise that occult knowledge is conveyed through this statue about the Precession of the Equinoxes. 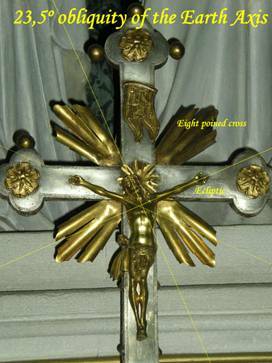 Remember that the same esoteric symbolism of the slanted 23,5 degree angles that can be found in Christian art was also used by Dan Brown on his book cover. As we have mentioned before, the day of the ‘Raising Aloft of the Holy Cross’ most probably has an astronomical esoteric meaning. 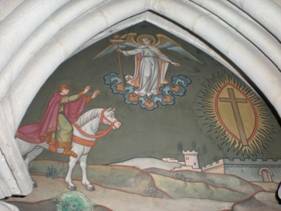 On the day of the ‘Raising Aloft of the Holy Cross’ or ‘Exaltation of the Cross’ (September 14th), the bishop stands in the center of the church, or cathedral, which is at the crossing of nave and the transept. He takes the holy cross and raises it above his head while the choir sings Kyrie Eleison. He then makes the sign of the cross three times with the cross in hands. Slowly, he bows down to the ground and stands to raise the cross again above his head. This is why the ceremony is called the ‘Raising Aloft of the Holy Cross’. The cross is erected from its horizontal to its vertical position similar to the erection of the cross on which Christ died before the crucifixion. This ceremony is repeated four times to all four cardinal directions. The ‘Raising Aloft of the Cross’ under the eight-pointed cross intersection of the nave and transcept exoterically symbolizes the raising of the ‘True Cross’ of the crucifixion, while esoterically it may have an astronomical connotation. The exoteric meaning of the raising of the cross corresponds with the 12th Station of the Cross when the cross of the crucifixion is raised (erected) and Jesus is finally nailed to the cross. Is it a coincidence then that the 12th station of the Cross and the ensuing death of Christ on the cross echoes the death of the Sun in the Precession Cycle when it has passed through all of the twelve signs of the Zodiac? (the 12 stations so to speak) Is he to be reborn and resurrected for the next Precession Cycle after his death on the Zodiac, or true, Cross? 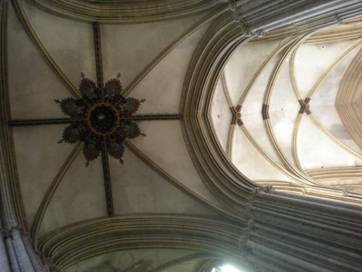 Most churches and cathedrals have nave and transept both forming one huge four-pointed cross. At the crossing the legs of this cross, the ceiling contains an eight-pointed cross. So churches and cathedrals are built of a four-pointed cross with an eight pointed cross at the intersection. This consistent symbolism. Cathedral Bayeux France. During Great Celestial Conjunctions when the two crosses merge, either the Equinox or Solstice Axisstands perfectly erect with respect to the Galactic Equator. The astronomer Nick Fiorenza has termed this astronomical event that only occurs four times during a precession cycle of 26,000 years ( ‘The Erection of the Holy Cross’). It occurs again in era-2012 (in between 1978-2017). The raising of the cross by the bishop under the eight-pointed cross on the ceiling may therefore esoterically encode the raising of the true cross (Zodiac Equinox-Solstitium Axis) at the ‘End of Times’ when the Equinox or Solistitium Axis also stands perpendicular to the Galactic Equator. The Maya Scholar Linda Schele interpreted the Maya Creation myth as the myth that encodes the movement of the Milky Way across the skies of August 13 690 AD, the date of the dedication of the Cross at Palenque. Central in the Maya Creation myth is the raising of the sky or Wakah Chan (raised up sky). The Wakah Chan depicted in the ‘Tablet of the Cross’ at Palenque represents the World Tree and, according to Schele, it must not only be associated with eight partitions of the sky but also with the intersection of the Milky Way and the Ecliptic. At dawn on the morning of August 13, 690 AD; according to Maya myth, Creation was finally established when the Milky Way stood fully erect with respect to the horizon. The ‘raised up sky’ had dawned. Coincidence or not, but the 15th of September is the only date that the Milky Way stands perfectly erect in Washington D.C. at dawn in our era! The day of the ‘Exaltation of the Cross’ coincides with the ‘raising of the sky’ that plays such an important role in the Maya creation myth. There has been much debate about just how the Key of Solomon ties into Dan Brown’s latest novel. Though we have extensively written on the information found in this ancient text we will now provide a brief synopsis for those wishing a quick summary. It was our decoding of the following cipher within the Key of Solomon manuscript that initially affirmed our work being presented. The central star represents our Sun. The partial circle between slopes on the left and right sides is the Egyptian ‘akhet’ hieroglyph. It translates ‘horizon’. There are two of these, hence eastern and western horizons. The stars around the rim are actually a sequential puzzle, and when properly joined, form the Pleiades star cluster. The small cross-like symbol appears to be the final clue and relates to the astronomy of Precession. So the clues thus far are, Sun on the Milky Way, eastern and western horizon, the Pleiades constellation, and the final small ‘cross’ symbol. When combined, the conclusion is quite clear. 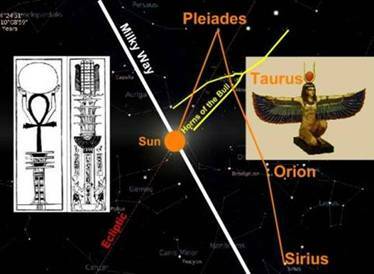 During the last Great Celestial Conjunction around 4,500 BC, the Vernal Equinox Sun (central star, akhet glyphs, eastern and western horizon) was on the Milky Way (pillar beneath central Sun) and the Pleiades (rim stars) were used to point to the place where the Sun would both rise and cross the Galactic Equator, a pointer. The diagram below shows both the sequence for decoding the outer rim stars and the function of the Pleiades cluster to point the Sun on the Milky Way. The central star or Sun falls on the Ecliptic Plane exactly where it should be. This would confirm our suspicion that this star is really our Sun. 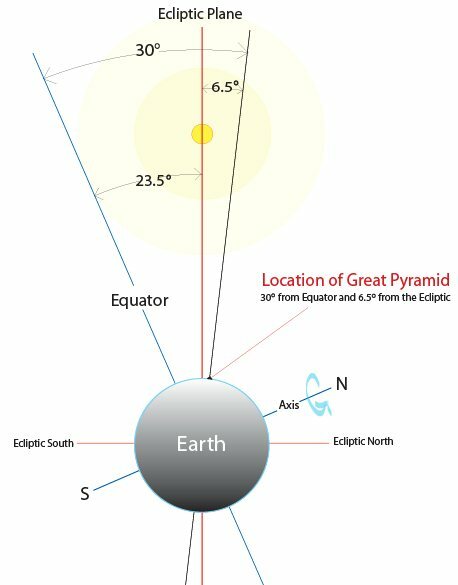 The symbol’s remaining two diagonal lines match up surprisingly well with the axial tilt (23.5 degrees) and the ‘Precessional Cone’ of the Earth. If our interpretation is correct, then every symbol discussed points to and reinforces our overall thesis. 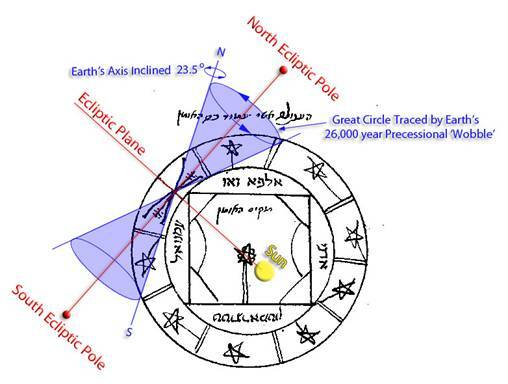 This piece of the Key of Solomon parchment appears to be communicating knowledge of not only the last great Celestial Conjunction around 4,500 BC, but also to the cyclical nature of this phenomenon. A brief timeline is required to better fathom the scope and details of the Capitol. Only then can you the reader (or initiate, if you will) better comprehend the meaning of the symbols. The question of where to locate the United States Capital was initially raised in 1783. Among the numerous sites to be suggested were New York City, Philadelphia, Annapolis, Princeton and Williamsburg just to name a few. Of the numerous disputed points was the fact that the Northern States did not want to recognize a capital in the South and vice-versa. There was even an agreement that provided for two separate capitals that was revoked the following year. The Constitutional Convention was held in 1787 and saw the drafting of the Constitution. The United States Congress was established upon ratification of the Constitution in 1789, and New York was the initial place of convening. With the Constitution's ratification, both the need and process for establishing a permanent and official Capital was in place. When Congress met in 1790, an agreement on the site had yet to be reached. Alexander Hamilton was the Secretary of Treasury at the time and was pushing Congress to pass a financial plan, or budget. One of the key components in the plan was in dealing with the debt still left from the Revolutionary War. The Northern States were still heavily burdened, and Hamilton's plan was to have the Federal government consolidate and assume the debt. An aspect of the plan included Southern States to help in the payment; they obviously were not that thrilled. Thomas Jefferson encountered Alexander Hamilton at the home of George Washington later that year. Jefferson kindly (and wisely) offered to host a dinner to bring both parties together and adjudicate a solution to the stalemate. This proved fruitful and productive as a compromise was reached. The Northern delegates would approve of the southern (and current) Potomac River site, while the more prosperous and affluent Southern delegates would agree to the Federal government assuming War debts of the Northern States, and hence helping to pay those debts themselves. The 'Assumption Bill' was thus narrowly approved by both houses, and the consequent 'Residence Act' gave the President George Washington the authority to select the precise location and hire the appropriate surveyor for the project. Congress held its first session in the still unfinished Capital Building on November 17, 1800. It would be another 11 years before both wings were complete setting a model for both Federal budget and building miscalculations for two centuries! Noted French architect Pierre L'Enfant first expressed his desire for the design of the Capital to George Washington in 1789. At that time, there was a hot debate about exactly where this new city would be located. L'Enfant's aspirations had to be put on hold until 1791 with the passage of the Residence Act. With his newly granted authority, Washington quickly appointed L'Enfant to begin design work on the new Capital. 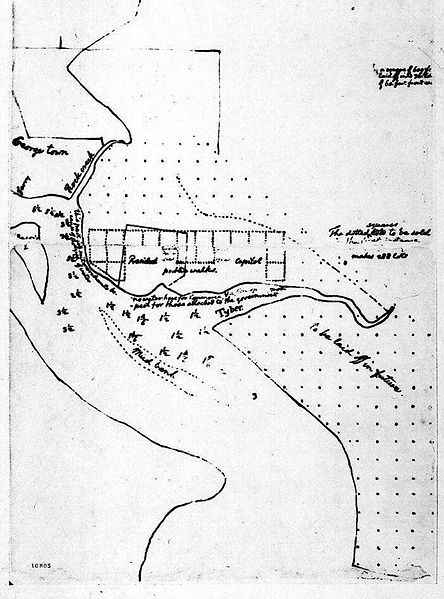 Thomas Jefferson wrote letters to L'Enfant outlining his objectives and Pierre's task of designing the federal city and sites for the government buildings. Jefferson had quite modest ideas for the design. When the architect’s draft design was presented to President Washington later that year........... it was obvious that Pierre L'Enfant had much more exalted plans for the Capital of the New World. 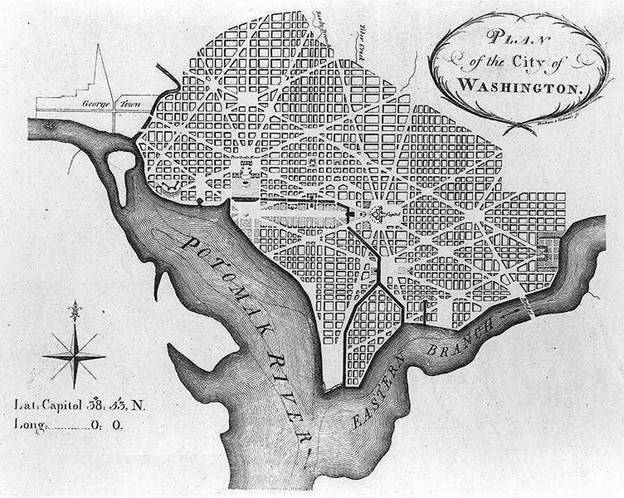 1792 Revision of Pierre L’Enfant’s Design for the Capital of Washington D.C.
Pierre L'Enfant was gifted French-born American architect and civil engineer. It should be noted that he left formal studies at the Louvre in Paris to enlist and fight in the American Revolution. Pierre L'Enfant could not help but be influenced by the baroque-style gardens of the Louvre as his father had been a court painter at Versailles. It cannot be overlooked that L'Enfant based his Capitol City designs on the work of Le Notre as used at Versailles and Domenico Fonatana’s plan for the re-design or Rome under Pope Sixtus V. The latter is most interesting for it was the peculiar re-design of Rome under Sixtus V that originally caught our attention last year! It was this monumental re-design of Rome and peculiar placement of bridges, fountains and obelisks which show a peculiar affinity for the Sun at specific times of the year. We have demonstrated that in our article was that this re-design of Rome was to meant encode a very unique and ancient method of tracking the phenomenon of the Earth's wobble about its axis, or Precession. It is this distinctive movement, or wobble, of the Earth that allows us to observe the Sun traveling along its path in the heavens through the signs of the Zodiac, also known as the Precession of the Equinoxes. Cultures throughout the ancient world knew of, and more importantly recorded, this phenomenon. It would appear that the actual layout and design of Washington D.C. encodes this knowledge as well. Everyone knows of the Great Pyramid. Fewer people know of the actual precision of this pillar of human achievement. (For instance, The Paris Observatory is the most accurately aligned modern structure and varies a mere 6 minutes of a degree from true North . . . . . the Great Pyramid is off by only 3 minutes) Fewer still know or have heard of the Pyramid’s internal and external functions. For brevity, we will leave the reader to do their own research and focus only on one of purposes served by the Great Pyramid……. as the Prime Meridian. The Prime Meridian is the line of longitude (runs North-South) that is defined as 0 degrees. It from this vertical line that makes it possible to ‘step-off’ and measure all other lines of longitude; without an understanding and accurate measurement of longitude, accurate navigation and mapmaking would not be possible. The choice for a Prime Meridian is purely arbitrary, and could theoretically be placed anywhere. Typically, a large terrestrial landmark is used. Our current Prime Meridian runs through Greenwich, England. This was not always so. Thomas Jefferson even tried to get the Prime Meridian to run through the White House. Though Pierre L’Enfant originally planned on it running one mile east of the Capitol, by the time final drafts were realized the plan had the new Meridian running through the Capital Building itself. Curiously, when Thomas Jefferson became President in 1804, he requested that a new Meridian be surveyed that ran directly through the White House. This point was marked by a small granite stone known as ‘Jefferson’s Pier’. Scholars are still perplexed as to why Jefferson desired the new Meridian to run through the White House when he himself directed the survey of a different one when he was the Secretary of State 11 years prior. We believe we can explain why. . . . The authors of this article are immensely indebted to the work of Gary Osborn who has logically and undeniably demonstrated that the Great Pyramid was, designed to point to itself on the Earth. It was the work of Mr. Osborn that enabled us to make the connections and reach some of the conclusions being presented in this article. The Earth’s Axis of Rotation inclined at 23.5 Degrees from the Ecliptic. (The River Nile is highlighted). These images speak both volumes and for themselves. Astonishing as they may be, even out-of-context these diagrams do not do the entire research due credit. All of this is crucial to understand. For if we are only now beginning to understand this knowledge. . . . how was it that others have known throughout history? This (and other) information has been handed down and protected by secret societies (like Templars or Freemasons) for thousands of years. The knowledge has been passed to those initiated and deemed worthy, and it helps to explain some of the most curious artwork, actions and architecture in history. The Founding Fathers were documented Freemasons and would certainly be privy to such knowledge. 1792 Revision of Pierre L’Enfant’s Design for the Capitol of Washington D.C. The following diagram shows just what seems to have been the message of Washington D.C.
Credit to Gary Osborn who initially discovered this! Voila! The green triangle is a model of the Great Pyramid. The slope angle of each side is 52 degrees. Notice how well it fits the city plan! There even appears to be an intentional reference street on the left side (New Hampshire Avenue) which matches the 52 degree angle almost perfectly! The main avenues in red are all at 23.5 degrees and converge at the central point of the pyramid, also known as the King’s Chamber. The King’s Chamber happens to be none other than the White House. The New World’s Prime Meridian paying homage and reverence . . . . . to the ‘old’ one. It is also no coincidence that the desired Prime Meridian for the New World fell in a narrow strip of land referred to as ‘God’s Longitude’ and is fundamentally tied to our modern Gregorian calendar. 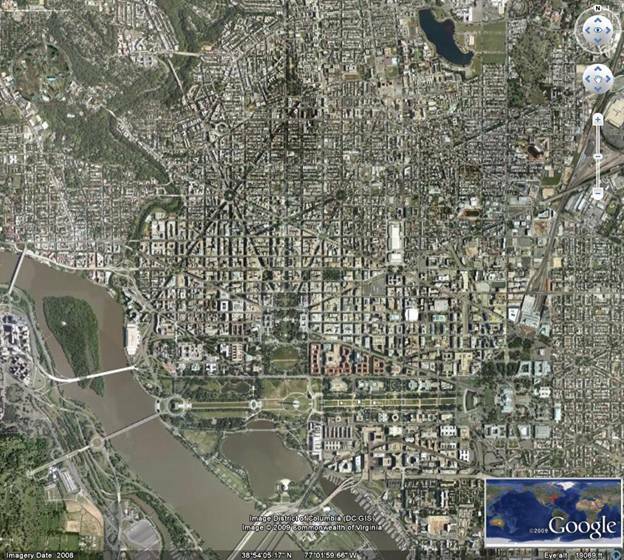 Next is a satellite image of Washington D.C. as it was built and exists today. 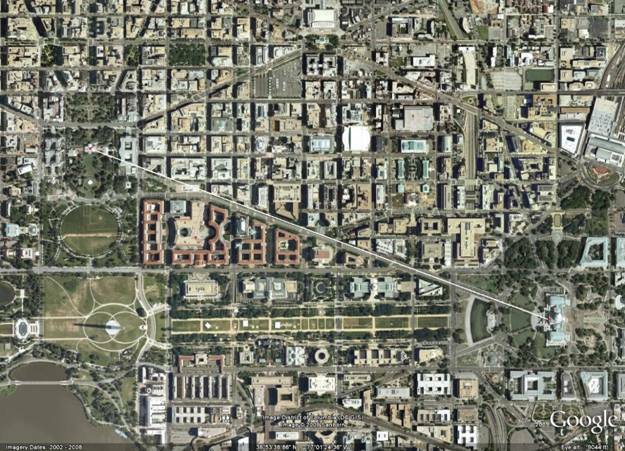 Take note of the similar street layout and positions of both the White House and the Capitol Building. 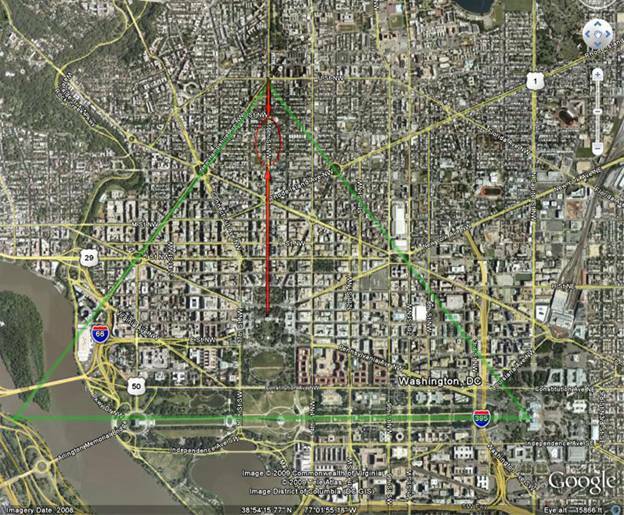 Let us now take the same scale diagram and see how faithfully L’Enfant’s plan was realized. The Great Pyramid model is not quite a perfect match but very close especially considering that the city covers over 70 square miles! Note how well the angle of the slope again matches the left-most street, New Hampshire Avenue. 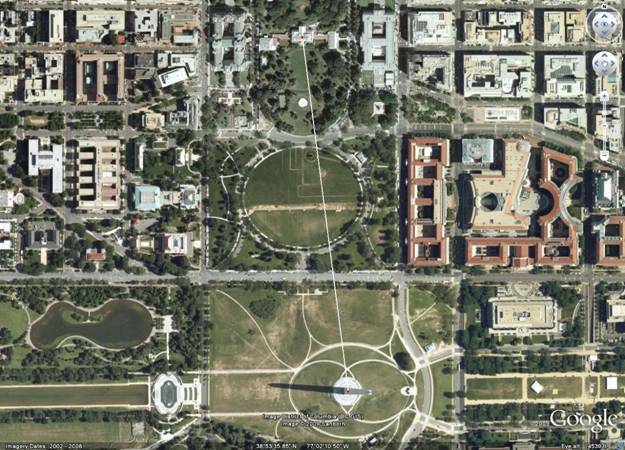 All the major avenues leading to the White House are angled at 23.5 degrees. Even though both Rhode Island and Massachusetts Avenues do not run through the White House, observe how they too are angled at 23.5 degrees. Even Arlington Memorial Bridge in the bottom left corner spans the Potomac River at this angle! *This apparent alteration to L’Enfant’s original plan also made possible an all-important alignment with the birth of the star Sirius on the horizon to be revealed in the following sections. When comparing the images above, it appears the aforementioned detail was intentionally added to Pierre L’Enfant’s plans for placement of the Capitol Building. Objectively, the actual building site for the Capitol Building could have been moved in the planning stage for any number of reasons. (foundational, logistics, etc.) But what are the odds that the Capitol Building would just so happen to move. . . . to exactly where it would align the White House with the birth of Sirius? Lastly, it is worthwhile to note that Gary Osborn has discovered a hidden mathematical code at the scale of 1/16th found and within the geometry of the Great Pyramid itself Can it be tallied as coincidence that the street that runs through the White House and the apex of our pyramid also just so happens to be . . . . 16th Street? There are two versions of ‘The Lost Symbol’ cover that have been made available to the public thus far. One is the United States version, and the other is the United Kingdom version. The first image shows the US version (See pictures above). The obvious elements are the large wax seal, the diagonal tear, and the US Capitol Building. The base of the pyramid sits atop the text and the ‘tears’ follow the slope of the Pyramid quite nicely, enough to hint at it anyway. Notice how the very apex of the pyramid is perfectly in-line with the top of the ‘33’ pyramid in the seal. Notice also how the red ‘Equator’ line runs through both King and Queen’s Chamber to the very top left corner of the cover. The red line bisecting the ‘33’ pyramid happens to point to the opposite corner. The blue lines highlight the obvious 23.5 degree slant of the font. There are more clues as well. This is an obvious allusion to the overall message being handed down and possibly in Brown’s book. . . . Precession. 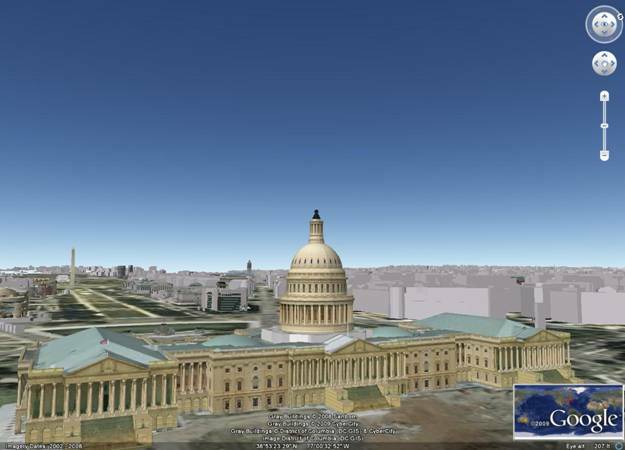 We can tell that the building is the US Capitol, but from what side? There is the genius of Mr. Brown; the clues have been given but in two differing covers! Now we can clearly see what side of the Capitol Building is being shown, the eastern side. Next we use our good friend GoogleEarth and match the perspective. The match is not perfect, but pretty darn close. 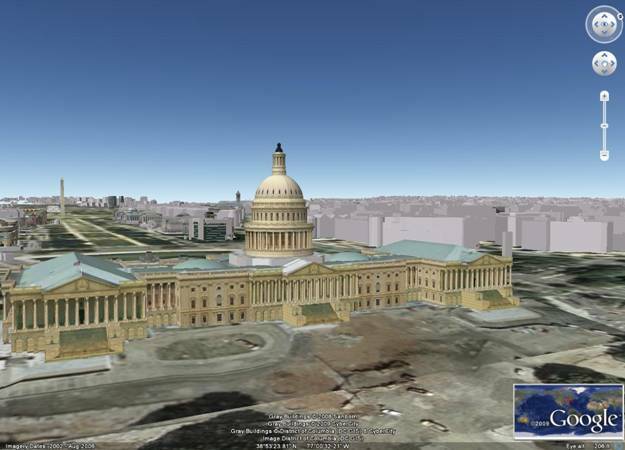 A perfect match is impossible given the 3D models employed by GoogleEarth, as they differ in both the scale and architecture of the actual buildings. But again, pretty darn close. . . .
Brown cleverly chose this perspective for several reasons. First, is what he left off the cover. Below is the same GoogleEarth image, only not cropped. We can see that the left edge of the book cover just so happens to cut-off where the obelisk should be. That would place the obelisk on the spine of the book would it not? Wayne Herschel has cleverly found a source that seems to confirm this theory; and according to him, an image of the Washington Monument does appear on the spine of the book. The second reason this perspective may have been chosen was just as intriguing. We know this cover photo clearly cuts off the Washington obelisk. It also hides something. . . . .
Look at what hides behind the Capitol Building if we nudge the building aside. The Capitol Dome was totally obscuring Pennsylvania Avenue, seen just to the left of the dome. Do you know what also lies on Pennsylvania Avenue. . . . . . the White House. So the White House, Washington Monument and Capitol Building are all connected; but why hide the connection? We have previously published work demonstrating that monuments in Washington D.C. that align with the Sun at solstices, just as in the Vatican. More have been found that are very thought-provoking. These clues help to lead us to the conclusion that these alignments were not only intentional, but obviously very well-thought-out. Near the beginning of this work, we shed some light on the unique day of September the 15th. Dan Brown obviously chose that date for a very specific reason. Most importantly, it is the only day that the ‘True Cross’ of Christianity reveals its pagan and sun worshiping roots as the Great Cross will be fully erect just before the dawning sun veils the stars in the sky. This date is both unique to this location on Earth and, to this time. It can only occur every 6,700 years (1/4 Precession Cycle) during a Great Celestial Conjunction, as we are going through now. The Freemasons have a long-standing tradition of venerating the star Sirius. Richard Hoagland has made an astonishing discovery that our modern Gregorian calendar was perfectly and timed and calcualted so as to have Sirius directly on the Meridian on January 1, 2000 AD to mark both the beginning and end of the Precession cycle! This veneration dates back to ancient Egypt as Sirius was the stellar embodiment of Isis. (We again refer the reader to Hoagland for a more detailed history and analysis of this relationship ) This fascination seems to be hidden within the city as well. The first alignment relates to the birth of Sirius on the horizon. This day was so important to the ancient Egyptians that it compelled them to base their calendar around it as it heralded the annual flooding of the Nile. Sirius was the stellar embodiment of Isis who paired with Osiris (Orion constellation) to give birth to their son Horus. A ‘heliacal rising’ is the day a heavenly body becomes visible on the horizon just before sunrise. The body in question (in this case, Sirius) was not visible before this special day as it was either below the horizon or hidden by the glare of the Sun. This heliacal rising of stars, as it is known, is how the Egyptians and other cultures measured and timed their calendars and is the basis for what is to be revealed next. Earlier, we mentioned that the road connecting the Capitol Building to the White House did not conform to the overwhelming 23.5 degree pattern. (This latter discrepancy actually helps to make this alignment possible.) The angle, or azimuth as it is known, was measured by GoogleEarth to be 110.43 degrees. The following is a screenshot from Starry Night Pro version 6.2. The viewing point has been set as if one were standing at the White House. This precise location was entered as 38° 53’ 51.52” N, by 77° 02’ 11.52” W.
Remember that from the White House to the Capitol Building is 110.43 degrees, or 110° 25’ 48”. Sirius rises at 111° 12.981’. (We will even round that up to 111o 13’) That equates to a difference of 47’ 12”. 47 MINUTES of arc!! That is a margin of error of LESS than 0.5%! 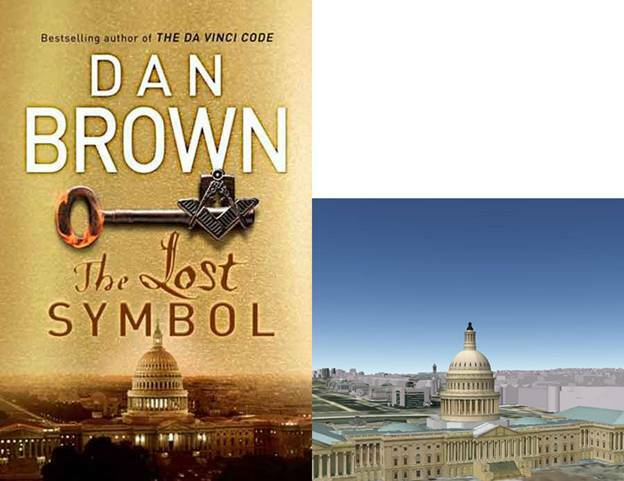 Remember that Dan Brown’s book cover has the central seal seen rising above the Capitol Dome? This gets even more thought-provoking when we see that the Egyptian hieroglyph for ‘Sirius” also contains a dome. The dome is one of three parts of the solar Trinity of Isis – Osiris – Horus. It is this mythos that has a long-documented history from Masonic authors and scholars, among them Albert Pike and Manley Hall. It is also this Trinity mythos that takes us to the second symbol and its unique alignment. The second part of the aforementioned Trinity is the male aspect. The generative force in the union is the pyramid symbol, meant to symbolize a phallus. There is only one pyramid or phallus monument in Washington D.C. . . . . . . the Washington Monument. First, we must determine the angle, or azimuth, from the White House to the Washington obelisk. The azimuth and distance were determined by GoogleEarth to be 172.61°, or 172° 36’36”. Distance between them is 2,989.26 feet. Let us fast-forward the sky on the star program until Sirius is at this precise azimuth as well. 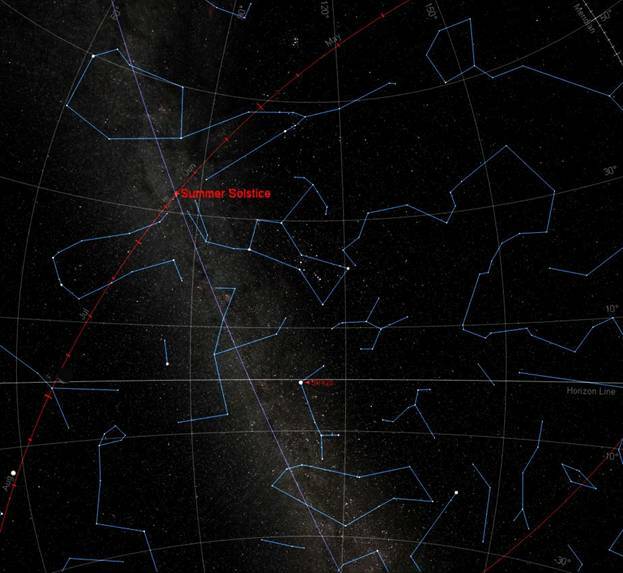 Again, Sirius is labeled in red. The vantage was purposefully shifted to fit in the Sun (yellow dot on left), but obviously does not affect calculations. Here are the details. Sirius is now located directly above the Washington Monument at 172° 36.724’, or 172° 36’ 43”. The height of the Washington Monument is known to be 555’ 5.125”, or 555.427 feet. 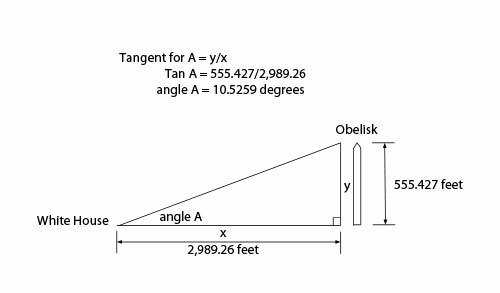 We now use simple geometry to determine the perceived height of the obelisk. altitude of 10° 31’ 33.24”. Here is the data from the same Starry Night image, only for now the Sun. 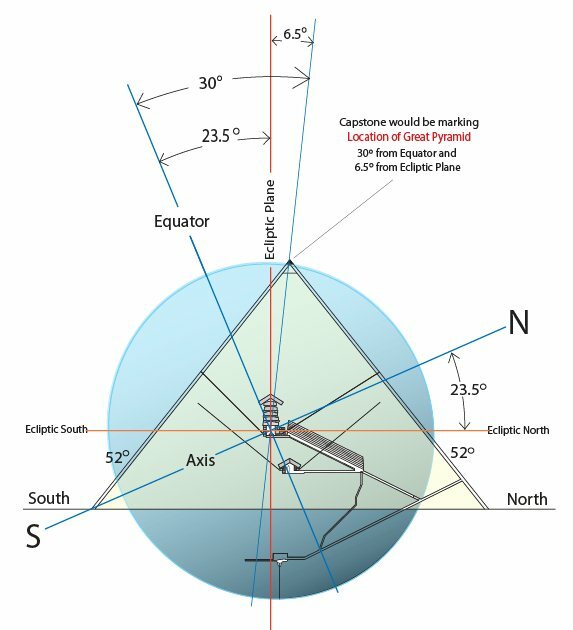 The Washington obelisk itself reaches an altitude of 10° 31’ 33.24”; and while Sirius is directly above the obelisk, the Sun is at an altitude 10° 46’ 38” in the sky. Subtract, and we have a difference of only 15’ 4” of arc. 15 MINUTES of arc! The margin of error is LESS than 0.25%! This alignment is less than 90 SECONDS from mathematically perfect! Such astonishing precision and timing was obviously VERY well-though-out and calculated. This means that while Sirius is in-line with the very center of the Washington Monument, the Sun itself is almost precisely at the height of the very tip of it! This last alignment is most interesting as it may not only fulfill the second male aspect of the Trinity; it also directly relates it to the Sun. You may recall that Isis (Sirius, dome shape, Capitol Building) unites with Osiris (Orion, pyramid shape, Washington Monument) and they conceive and give birth to Horus. The symbolism at play is thousands of years old, and we are living it right now. 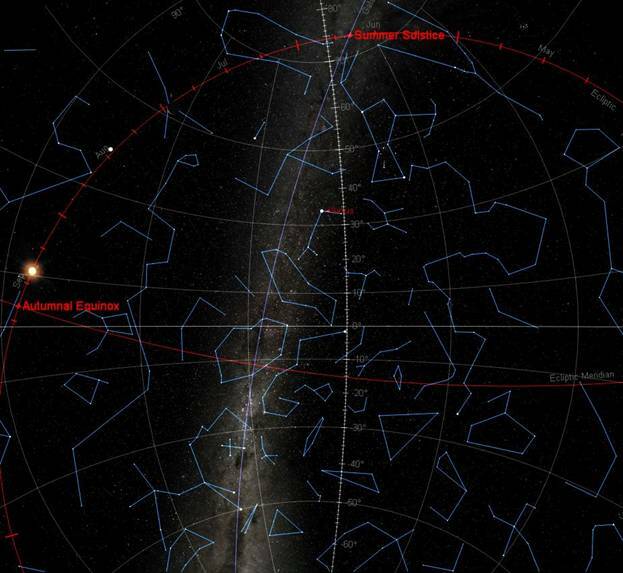 We are living in ‘era’ 2012 as the Sun is currently crossing the Milky Way/ Galactic Equator (during a solstice) only to be ‘born’ again on the other side. We are witnessing not only the birth of a ‘new’ Sun, but also of a new Age. 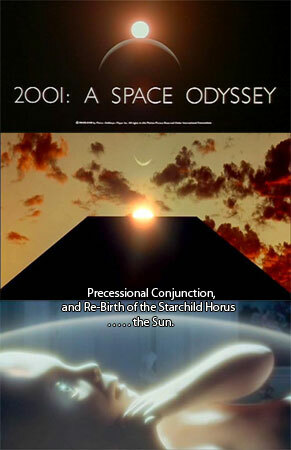 This is the grand cycle of ‘Precession’ and what the ancients were passing down and recording. It would seem that people have been passing this knowledge down all along though. . . .
. . . . right in plain sight.